Successfully Added Bluetooth Audio Receiver Dongle to your Shopping Cart. You gotta love technology and its ability to make life simple and more convenient. Take this Bluetooth Audio Receiver Dongle for example. 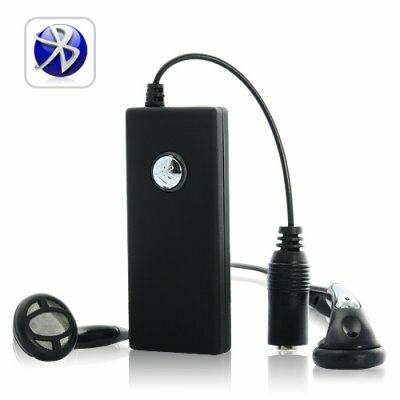 It works in unison with our Bluetooth Audio Transmitter Dongle [http://www.chinavasion.com/bluetooth-adapters/cvecb31/], or it can work as a standalone product. Let us show you both scenarios. Now go across the room, sit on the couch, and plug your headphones into the CVEC-B35 and press the Bluetooth activation button on the CVEC-35. Receiving. You're listening to music streamed across the room from your laptop without the need for cables and wires. No mess, no tripping and accidentally smashing your face. Happiness! Better yet, use the included RCA to red-white AV connectors so you can attach your speakers to the CVEC-B35 and your whole den/living room/family room is alive with the sound of music! Using your iPhone 4, Samsung Galaxy S, HTC Desire, as an audio source, pair it with the CVEC-B35. Whatever plays on your smartphone or other audio source is streamed to headphones or speakers...whatever you choose to connect to this Bluetooth Audio Receiver Dongle!!! Another Life innovation product from Chinavasion. Get rid of clutter, no wires and cables!